The attack on Bus Éireann workers is a deliberate and vicious assault, not only on their pay but on their conditions. . It is attack on all workers, whether they be in the public or the private sector, and it is the thin end of the wedge for privatisation. The company must and will be defeated and strike action, including a sympathetic strike, is the right and only response to this vicious attack on workers by the company. It is entirely proper that the Minister's constituents and the people of Dublin have good quality public transport such as the DART, Luas and bus services, both in Dublin and from Dublin to all the major towns and cities throughout the country. The towns in my constituency such as Ballina, Nenagh, Roscrea, Templemore, Tipperary town, Carrick-on-Suir, Cashel and Clonmel have substantially fewer transport rights and substandard bus and rail service. We have lost our bus routes in Carrick-on-Suir and the Minister and Iarnród Éireann want to close our rail lines through Ballybrophy, as well as the Limerick-Waterford line, where trains are cancelled almost on a daily basis and which is earmarked for closure by the Government. My constituents are entitled to the same adequate, good-quality transport service as are the people of Dublin. Far from cuts and the closure of routes, we need more services. The Minister should enact legislation to ensure more good quality transport services for all. The public, the elderly and social welfare recipients, wherever they are in the country, are entitled to a good quality public transport service at reasonable rates. Public transport services should not be subject to market forces as they are public services. The current difficulties are as a result of Government policy going back at least as far as 2009, which has been continued under the Minister and the current Government. 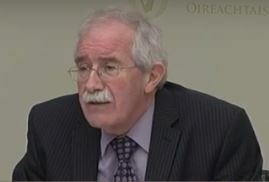 The subvention has been reduced from €44 million in 2009 to €33 million currently and the difficulty is anything but an industrial relations dispute. It is a policy issue that has been driven by the Minister and the Government. The difficult financial state of affairs of the company is largely as a result of the reduction in the subsidy and the free travel scheme, which is inadequately subvented by the Government. The attack on Bus Éireann workers is a deliberate and vicious assault, not only on their pay but on their conditions. A 30% reduction in pay is absolutely unacceptable and must and will be opposed trenchantly by the workers. It is more than an attack on the workers at Bus Éireann, however. It is attack on all workers, whether they be in the public or the private sector, and it is the thin end of the wedge for privatisation. The company must and will be defeated and strike action, including a sympathetic strike, is the right and only response to this vicious attack on workers by the company.